The Taiwanese bicycle industry has rapidly regained ground lost during the double digit decline in sales numbers and turnover in 2009. In early 2010 it was clear the bicycle industry was being affected seriously by the global economic crisis. TAIPEI, Taiwan – The Taiwanese bicycle industry has rapidly regained ground lost during the double digit decline in sales numbers and turnover in 2009. In early 2010 it was clear the bicycle industry was being affected seriously by the global economic crisis. As the global high-end supplier for the bicycle market, the Taiwanese were looking back at what appeared to be their most difficult year. But 2010 would deliver a very different and very welcome result, at least for the Taiwanese. According to official statistics from the Taiwan Bureau of Foreign Trade the export volume is nearly back to 2008 levels. By mid-2010 it was already clear that Taiwan bicycle exports to the European Union were picking up again. 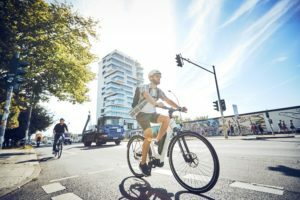 Despite the fact the EU markets for bicycles were not showing clear signs of recovery during the first half of 2010, Taiwan’s bike makers shipped 34.4% more bikes to Europe during this period than in the first six months of 2009. Especially during the second quarter, sales to Europe surged, with this market accounting for more than half the value of Taiwan’s total exports during the second quarter. Between January and October 2010 the number of bicycles exported increased by 17% to 4,142,252 units. In 2008 this figures still stood at 4.2 million, meaning that, in terms of volumes, the Taiwanese bicycle industry regained its losses within one year. With regard to value, the market remained relatively stable for the Taiwanese. In 2009, the industry was saved by the ongoing trend of rising prices per unit. 2010 however, was dominated by exchange rate uncertainties and fluctuations. As a result, it is difficult to compare export values between 2009 and 2010. The only meaningful conclusion to be drawn from the statistics of the Taiwan Bureau of Foreign Trade is that the export value (January – October 2010) topped at € 890 million (US$ 1.2 billion) resulting in an average price of € 214 per exported unit. 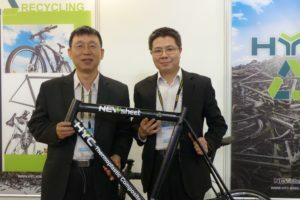 Nevertheless the Taiwanese bicycle industry is eager to keep up the pace for growing added value, to keep up with competition with low-cost neighbouring countries such as China, Vietnam, Indonesia and Bangladesh. 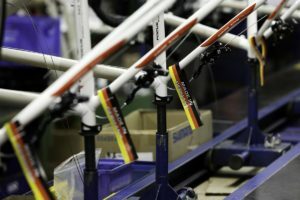 Therefore Taiwan’s top two bicycle manufacturers are investing heavily in an expansion of their production capacity and are allocating a sizeable part of the investments for high-end bikes. With its new Kunshan, China facility, Giant is doubling its production of carbon bikes. This facility will become operational in the second quarter of 2011 and have an annual output of 200,000 bikes with carbon frames. Currently, Giant, the world’s biggest bike maker, produces 100,000 carbon bikes in its Taichung, Taiwan plant. Alloy frames will also be produced at the new Kunshan facility which will have an annual capacity of 1.5 million bicycles. Since August 2010, Taiwan’s number two manufacturer – Merida, has poured TWD 250 million (€ 6.4 million) into capacity expansion, by procuring new production equipment and improving production lines in its factories in Taiwan and China. The expansion is to be completed in April 2011. 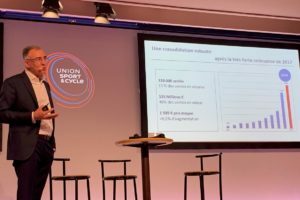 The European market remains by far the most important destination for Taiwanese bicycle exports, with a market share of nearly 75% in volume or 3 million units in 2010. The second most important market for Taiwan is North America, with a volume of just over 600,000 units. The main EU nations contributing to the increase were The Netherlands and Spain. In the Dutch market the Taiwanese gained a 37% growth rate in units, from 348,345 bikes in 2009, to 476,571 in 2010. As the Dutch port of Rotterdam is a major import location for bicycles, not all of these Taiwan originating bike were in fact sold to Dutch consumers. Most are re-exported to other EU member state countries. In Spain, the market for Taiwan-made bikes in units grew by more than 67%, from 111,223 to 186,180 bikes in 2010. 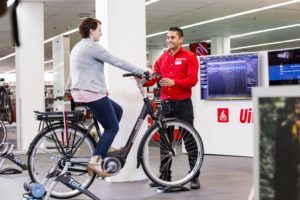 Also notable is the fact the two major Taiwanese bike brands, Giant and Merida, have a strong foothold in the two countries through subsidiaries. Relatively the increase in exports of Taiwan-originating bicycles to the European Union was even bigger to Portugal and Ireland. In Portugal imports increased from 19,338 units in 2009 to 50,281 last year. The difference between 2009 and 2010 was even bigger in Ireland. In 2009 the Taiwanese exported less than 4,000 bikes to Ireland. In 2010 those exports exploded, to 33,378 bikes. Perhaps the faltering Irish economy is forcing more people than ever to leave their car and use a bicycle for transportation again? The biggest market in Europe for the Taiwanese by far is the UK and the difference between the other EU member state countries has increased. In 2010 the UK market accounted for 933,682 bikes, an increase of no less than 62% related to 2009. Despite Taiwan’s leading position in the global trade in bicycles, e-bikes don’t play a role in exports. It looks as if the Taiwanese have left this segment behind and aren’t paying it any attention. There’s an obvious reason for this fact. It’s caused by the anti-dumping duties of 48.5% which apply to regular bicycles made in China and exported to Europe. These extra duties have stimulated bike production and export from Taiwan to Europe. However, there’s no anti-dumping duty on e-bikes made in China and exported to Europe. Not surprisingly, e-bikes destined for export to Europe are for the most part made in China. Last year Taiwan exported only 2,901 units worldwide, a decrease of 38% related to 2009. Flagship stores are hip. In Taiwan market leader Giant introduced its own Giant store concept before Taiwan’s bike sales boom came into the game. Merida and other home market producers such as KHS followed, opening retail outlets. Now some Western brands are following the trend. At the start of 2009 Specialized opened its first concept store in Taipei. A second Specialized store celebrated its opening in September 2009 in Taichung. Meanwhile, Spain’s Orbea opened their own version in Taipei (July 2009) and Author from the Czech Republic opened a flagship store in Taichung. Elsa has big plans. After opening the first Author flagship store in July 2009 in Taiwan a Chinese store was opened in January 2010, in Shenzhen City. “Actually we already sold the Author brand in China. Three years ago we opened a store in Shanghai. But they are all done with partners. The Shenzhen flagship store and the one in Taichung are in the hands of Author-Asia,” explains Huang on our visit at the Taichung Author store. A second store in Shenzhen is now in the pipeline. Further ones are expected – with the help of partners, in other Chinese urban areas such as Kunming, Hanzhou and Luoyang in Honan. The stores are selling many road bikes. “At the present time, high-end road bikes with carbon frames are an especially good sale,” says Elsa Huang who continues: “Up to now our country is invaded mainly by numerous Giant and Merida stores. We are small and new on this market. Customers are already looking for good alternatives we can offer them.” The Author store in Taichung is not only selling Author bicycles but also numerous premium parts and accessory brands. It also houses Author’s (sub-)brand A-Gang. Moreover there are some Ceepo triathlon bikes on display. Whether more flagship stores presenting Western brands will be opened in Taiwan will depend on the further development of the island’s bicycle market. Domestic sales 2010 slowed after a strong showing over the last years.